Casino games developer EGT seem to specialise in pokies where colourful dice symbols are mixed in with something seemingly random, and this is exactly what their Dice of Magic video pokie looks like. Apart from the lower-value dice symbols, there’s wizards, crystal balls and unicorns filling the 5 reels, and even these are pictured as the faces of even more dice, but whatever the style, it’s got some interesting features such as free spins, wilds and the Topping Reels format that can lead to multiple wins in a single spin. This pokie also has a gamble round and the Jackpot Cards progressive feature that’s common to all EGT games and can randomly trigger some big payouts. The symbols are arranged over 3 rows, with 25 paylines running across them, and to win in the basic game, players will need 3 or more matching symbols to stop across a line on adjacent reels running from the left side. 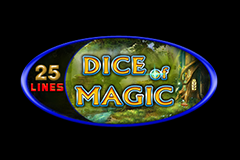 All 25 lines are in play, so there’s no option to get started with just a tiny wager on a line or two, but free Dice of Magic video pokies can be tried out before players need to place the low limit bet of 0.25 on a real money spin, and this can be raised to a maximum of 25.00 to suit their budgets. The magical theme may not cover all the symbols, but it surrounds the reels, where we see a background picture of some sort of enchanted forest, which may not be very unique, but looks nice anyway. Along with the game title above the reels, there’s the Club, Heart, Diamond and Spade progressive jackpot values, each steadily rising as players across all EGT games have a small portion of each wager added to the pot. Before playing, it can be worth a review of the pay table, just to see what each symbol combination is worth, and how the bonus features work. Naturally, it’s the dice that fill out the lower end of this table, starting with the pink and light blue that each pay 5, 20 or 80 coins when landing on 3, 4 or 5 reels across a line, and followed by the red and green dice that are both worth 5, 25 or 100 coins. Blue and yellow dice are each worth a little more and then we get to the beautifully-drawn picture symbols, which have a unicorn paying out 25, 50 or 250 coins, while the girl is valued at 25, 100 or 500 coins and the boy across 3, 4 or 5 reels on a line pays out rewards are equal to 30, 200 or 1000. Each time a winning combination is made, the Topping Reels feature comes into effect, where all symbols that were part of the win will disappear, leaving empty spaces for symbols to drop down into from above. This can create further winning lines, which repeats the process, potentially several times over. This isn’t the only bonus feature however, as the wizard is a stacked wild symbol who can fill any of the middle 3 reels when he turns up and magically substitutes for all others, except for the crystal ball. When he does this, he can complete a winning line by filling in any missing symbol across a payline, or turn a line of 3 matching symbols into a line of 4 for a higher prize. When the pink crystal ball stops in any 3 positions on reels 1, 2and 3, players are awarded 7 free spins, plus there’s an initial 125 coin payout, so even if no winning combinations are spun up in the free games, players will still get a consolation prize. Any win of 875 or less can be gambled, and players can double the triggering bet by correctly deciding if a playing card will be from a red or black suit, but a wrong pick loses the gamble, so be warned. If the Jackpot Cards round is triggered at random, players are guaranteed to win one of the card suit jackpots displayed above the reels, and the prize will be whichever suit is found 3 times from a line-up of 12 face down playing cards laid out before them. The Club win tends to be fairly modest, but the top Spade award can be substantial. This is an interesting online casino pokie that has a popular theme and some pleasing bonus rounds. The Topping Reels feature can be especially rewarding and will often lead to a second or even third win from a single spin, and although only 7 free spins are granted, there’s still a payout before they begin, so players will still be ahead.